This documentary explores the accidental movie career of Toshiro Mifune, one of the true giants of world cinema. 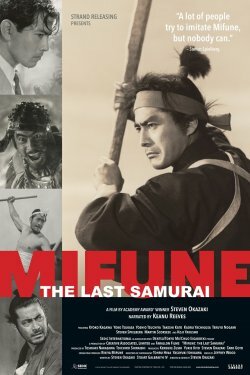 Mifune made sixteen remarkable films with director Akira Kurosawa during the Golden Age of Japanese Cinema, including "Rashomon," "Seven Samurai" and "Yojimbo." Together they thrilled audiences and influenced filmmaking around the world, providing direct inspiration for not only "The Magnificent Seven" and Sergio Leone and Clint Eastwood's breakthrough, "A Fistful of Dollars," but also George Lucas' "Star Wars."